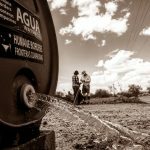 One of the sad realities that Humane Borders volunteers must face is that migrant deaths continue despite our best efforts, including in areas where we maintain water stations. We can’t predict exactly the routes migrants will be walking, and the patterns of migration change from week to week. A water station that may not have been used for a month may turn up needing 30 gallons of water on our next trip. We know there are hotspots that we can’t service due to the lack of roads or other factors, such as landowners who do not agree with our mission, or lack of sufficient resources. I drive the Buenos Aires National Wildlife Refuge (“BANWR”) route every Friday. 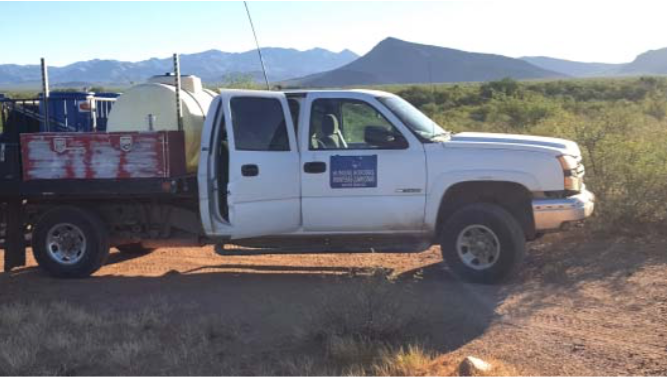 We service seven water stations, all of which are on dirt roads near Arizona Route 286, a north-south road that leads from Three Points, Arizona to the border at Sasabe. A look at our death map at www.humaneborders.info reveals that eight of the 117 sets of human remains discovered through October of this year were found in the general area of the BANWR route. Shockingly, four people died either very near or right at the side of Route 286. 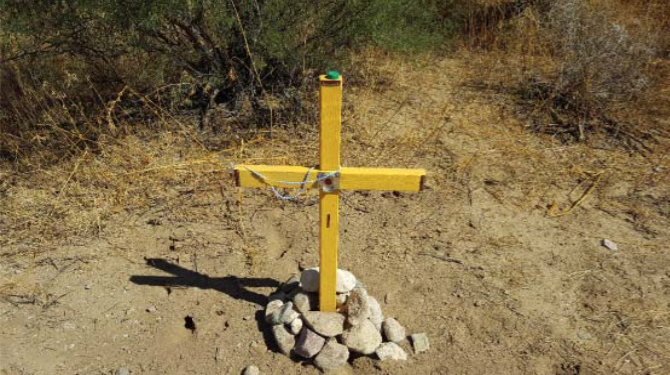 There are three crosses on Route 286, one of which is pictured on the cover, erected where a migrant died on the roadside in prior years. Our volunteers often wonder aloud, “How could this happen?” How could a migrant expire on the roadside, with no one giving the dying person any life-saving help? Was it too dark for people passing by in cars or trucks to see the migrant in distress? Did motorists, possibly including government workers, decide out of hostility or fear or lack of empathy to ignore the fellow human being in obvious need of help? Most importantly, what more can we as humanitarian workers do to stop this from happening? Many of these victims cannot be identified because by the time they are found, their bodies have become skeletons, stripped bare by birds and coyotes and the elements. However, we know from the death map that on June 8, 2017, a 30 year-old man named Felipe Vargas Reynoso died of exposure and probable hyperthermia on the shoulder of Route 286, very near its northern terminus. I would like to dedicate this issue of our newsletter to the memory of Mr. Reynoso. In his memory, I know that I speak for all of us when I pledge that Humane Borders volunteers will continue doing this work, and we will give it everything we have. We will do it with conviction, with dedication, with compassion, and with the utmost care. We won’t stop until all migrant deaths on our southern border come to an end. 4. Ensure that rescue operations provide for human rights, safety and dignity. 9. 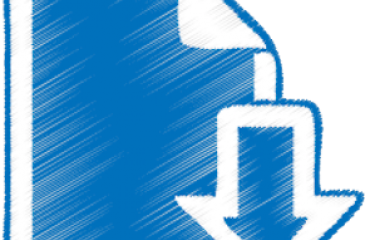 Ensure that removals and returns are implemented with due process guarantees; 10. Implement strong bilateral, regional and international cooperation to promote human rights-based, equitable, dignified, lawful and evidence-based migration and border governance. The United Nations High Commissioner on Refugees estimates that there are about 22.5 million people in the world today who in some way meet the definition of refugee(1), approximately 65.6 million forcibly displaced people in the world who do not meet that definition and another estimated 10 million people without any nationality at all. This human flow is unprecedented. There is no global convention or protocol dealing with the 65.6 million individuals who are neither stateless nor are considered refugees by their country of residence and who are generally referred to as migrants. The International Organization for Migration reported that over 7,000 migrants died during 2016, a record high since the organization has tracked such deaths. Humane Borders’ map of migrant mortality (humaneborders.info) shows 117 deaths just this year (through October, 2017) in southern Arizona. These individuals were likely a mix of people who may have attained refugee status had they lived and those who would likely be classified as migrants. In 2014, the United Nations, noting this unprecedented flow of human migration, developed Principles and Guidelines on Human Rights at International Borders. In the fall of 2016, for the first time since the negotiations following World War II, heads of states from all around the world came together in New York to discuss what was characterized as the “biggest humanitarian crisis of our time”. For the first time, that discussion focused on both refugees and migrants. Member countries decided to work on two separate global compacts – one for refugees and one for migrants, and to attempt to conclude both by the end of 2018. The process for negotiating the compact on migration is led by co-facilitators from Mexico and Switzerland. Also this year, the United Nations Special Rapporteur for Extrajudicial, Summary or Arbitrary Executions, a post created by the United Nations Commission on Human Rights, convened an experts meeting on the Unlawful Death of Refugees in Migrants in New York City. Juanita Molina, Executive Director of both Humane Borders and Border Action Network, participated in that meeting and reviewed the draft report. (Humane Borders did not incur travel expenses for participation in either U.N. meeting). 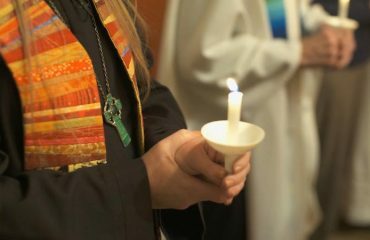 While Humane Borders’ priority for use of our limited resources will always be focused on preventing death in our own backyard, we are cognizant of the migrant deaths occurring worldwide and the tremendous challenges all displaced individuals face when forced by circumstances to leave their homes. Because we do have unique experience and concerns to contribute to the process, Humane Borders has applied for special consultative status with the United Nations organization involved in these efforts. To the extent possible, we will continue to follow and participate in these global developments. 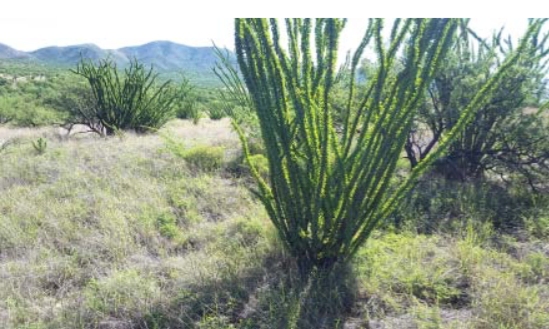 Within the past year local humanitarian aid workers became aware of a site two miles south of the U.S.-Mexico border, in Sonoyta, Sonora, where dozens of Central Americans were laid up in hardscrabble conditions, hoping to enter the U.S. Most, if not all, are candidates for asylum. Our initial visit to Sonoyta revealed a soccer field size dirt lot scattered with makeshift tents and a small single story building alongside an arroyo (an arroyo is a small stream). The scene more resembled a refugee camp than a traditional shelter. We learned that there is one toilet, no reliable water, potable or otherwise, and no consistent source of food. The men we met were cooking rice and beans atop a 55 gallon drum wood fueled stove when we arrived. Examinations by medically trained volunteers revealed myriad untreated injuries incurred en route primarily from Honduras and Guatemala. Nearly all the men were dehydrated and malnourished. Over the past few months the number of residents has pushed 100 and now includes several women. There’s no end in sight. The shelter is a kind of limbo. . . between worlds . . . between governments . . . between cultures and laws. 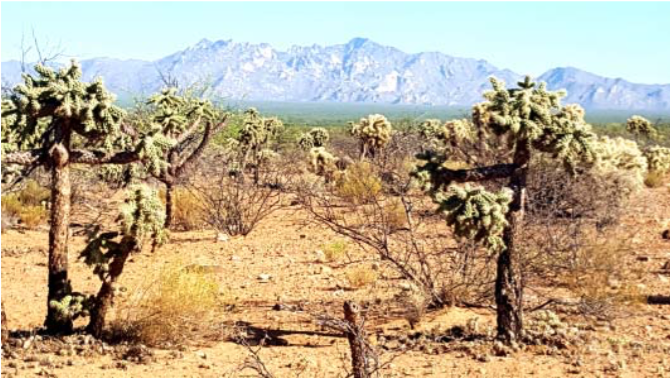 The conditions we observed offer a measure of insight into the increased number of deaths recorded in recent years in the Tucson Sector within a few miles of the border. Human Borders response to this situation has been to provide 325 gallons of water and attendant supplies to the shelter weekly. Our commitment is open-ended. Other U.S. based organizations are supplying food, clothing, blankets and medical aid. Collectively, we have widened our vision of humanitarian aid, allies and solidarity with our neighbors to the south. In so doing, we have deepened our commitment to life, to human rights and to people seeking safe haven and family reunification. Water is, after all, life… on either side of the border. 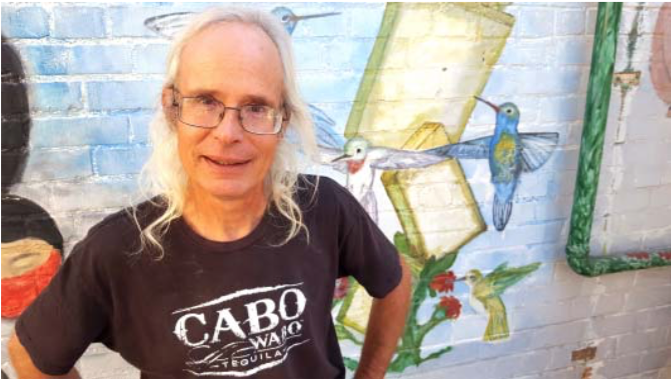 Editor’s note: John Heid lives in Ajo, Arizona, and is now Humane Borders coordinator there for our water stations in the far western portion of Organ Pipe Cactus National Monument and CabezaPrieta National Wildlife Refuge as well as our new work in Sonoyta. We appreciate his work with us and his devotion to human life. 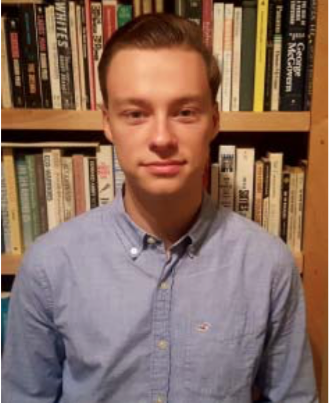 ERIK CLARK KOLSRUD, 22, is a Tucson native and University of Arizona senior who is majoring in Journalism. He plans to go to law school after graduation in 2018. His newspaper articles have been published in the Arizona Daily Star and the Tombstone Epitaph. Erik also serves as an intern at the South Tucson office of Cong. Raul Grijalva. Somehow he finds the time to drive the Ironwood Forest National Monument water run in season, substitute drives the Buenos Aires National Wildlife Refuge run as needed, and volunteers as a passenger on other runs as well. He has also recruited other U of A students to ride along with him. “I have always lived near the border, but I hadn’t thought much about the human issues involved with undocumented migration until I wrote an article about migrants in Nogales last year. That really opened my eyes, and I decided to write an article about Humane Borders, which led me to become a volunteer. I came to believe that we have a migrant crisis in southern Arizona, and that it’s a part of the larger, world-wide migrant problem, a link that people don’t always make. CANDY GRAJEDA lives in Tucson with her three daughters, Nischal, age 15, Dahniza, 10, and Jezahmey, 2. She attended Desert View High School, and she has an Associate’s Degree in Criminal Justice from Brookline College in Tucson. Candy has been volunteering for Humane Borders since the Spring of 2016, primarily on the Buenos Aires National Wildlife Refuge water run. She has also volunteered to pick up trash on Arizona Route 286, where Humane Borders has “adopted” a mile to clean up periodically. One of Candy’s talents is her knowledge of automobiles and automobile mechanics. 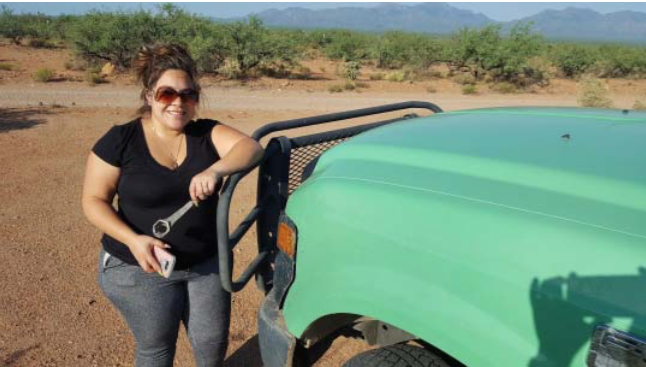 More than once, she has offered helpful suggestions and gotten her hands dirty helping out with a mechanical problem with one of our trucks. 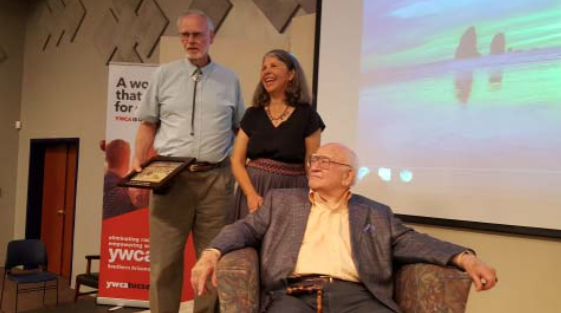 On October 14, 2017, Humane Borders held a dinner at the Tucson YWCA to honor some of its most outstanding volunteers. 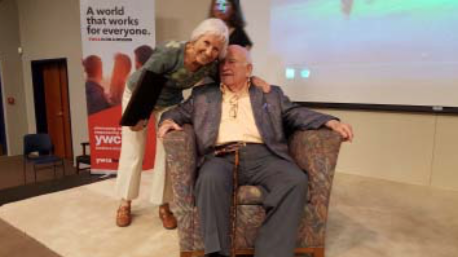 Ed Asner, star of the TV series Lou Grant and the Mary Tyler Moore Show, winner of seven Emmy Awards, and former head of the Screen Actors’ Guild, served as the master of ceremonies. Mr. Asner presented Humane Borders awards to three deserving recipients, whose photographs are below: Lois Martin, a volunteer since 2005 and an inveterate activist who also works for No More Deaths and leads the opposition to Operation Streamline, the assembly-line “justice” meted out to migrants in the federal court system; Gary Wolfe, a former Board member who served ably as our Treasurer for seven years and who managed the renovation of the current Humane Borders office; and Gene Buell, a nine year volunteer and long-time faithful weekly driver on the Buenos Aires National Wildlife Refuge water run. 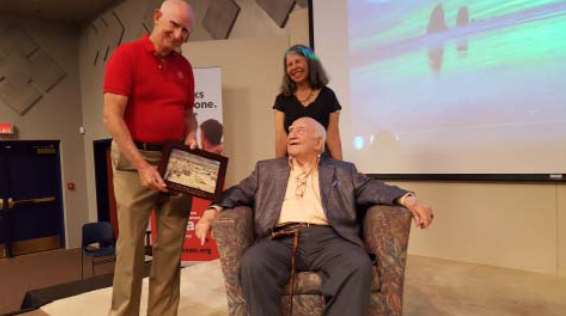 On November 17th, Humane Borders partnered with the Loft Theater in Tucson for the showing of the film Human Flow. Directed by the Chinese activist and exile Ai WeiWei, the documentary was filmed in 23 countries and provides a graphic visual narrative of the 65 million displaced people around the world. A movie trailer and list of locations where it is showing can be found here: https://www.humanflow.com/ Additionally, it is available through Amazon Smile and is also available for free online viewing. All of our water stations are identified with a name, most frequently the name of a person or a geographic location. From time to time in the Desert Fountain, we’ll explore names of individual stations. 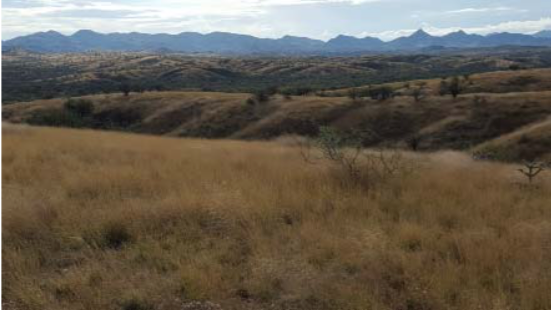 Humane Borders recently adopted mile 22-23 on Highway 286, the route that we travel weekly to service seven water stations and to give water to Grupo Beta in Sasabe, Sonora. We will generally host or participate in four cleanups a year. On January 27, 2018, we’ll participate in a cleanup of the entire highway all the way to the border. This is your chance to be part of the only clean-up in the U.S. of an entire highway! The cleanup is sponsored by Rancho Sierra Vista de Sasabe, the Altar Valley Con- servation Alliance and the Arizona Department of Transportation. Safety vests, bags, trash pickers and snacks will be provided. 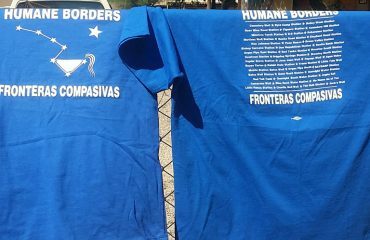 If you are interested in participating with Humane Borders, please send us an email at: info@humaneborders.org!